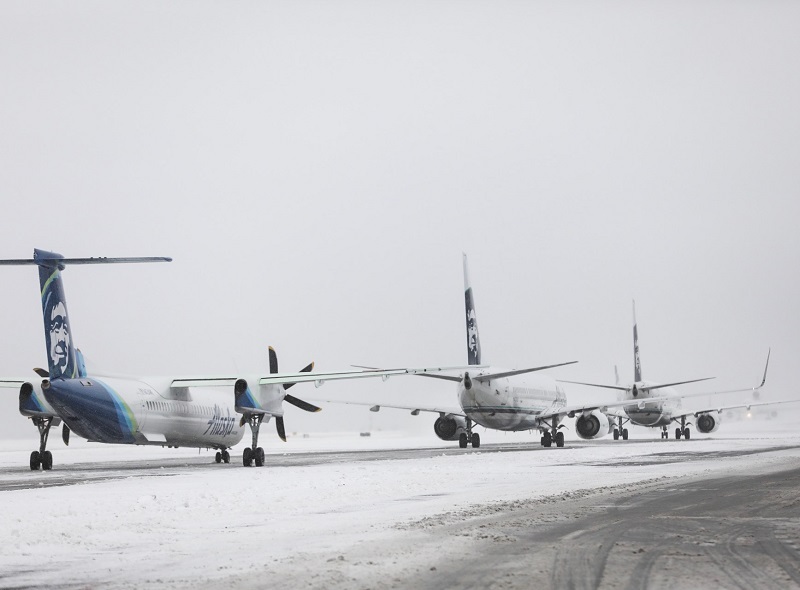 As of 4 p.m. Pacific time, today’s wintry weather is a factor in nearly all the 154 Alaska flights that have been canceled to and from Seattle, impacting the travel plans of more than 13,600 passengers. Thanks again to all of our guests who worked with us on a not-so-great day for traveling at our main hub. As of 2 p.m. Pacific time, today’s wintry weather is a factor in nearly all the 133 Alaska flights that have been canceled to and from Seattle, impacting the travel plans of nearly 12,000 passengers. We appreciate the patience of our guests during this difficult travel day. We’re doing everything we can to get all of our customers to their destinations. The beginning of February is giving us a big reminder that it’s still winter in the Pacific Northwest. A potent snow storm has slowed operations at Sea-Tac Airport for us and all other airlines today. We’ve canceled at least 80 flights and there are a significant number of delays. A Ground Delay Program – instituted by Air Traffic Control – is also in effect at the airport, which slows the number of arriving flights and reduces congestion. As of 10 a.m. Pacific time, the weather is a factor in nearly all 80 Alaska flights that have been canceled to and from Seattle, impacting the travel plans of more than 6,700 passengers. Deicing operations have been underway since the overnight hours with a full fleet of trucks and equipment. As air traffic volume has increased during the day, deicing of aircraft has slowed because of the weather conditions. Just getting to Sea-Tac has been a big problem today, not only for our guests but for our employees and others who work at the airport. Icy and snow-packed roads across the greater Seattle area has made commuting difficult and treacherous. 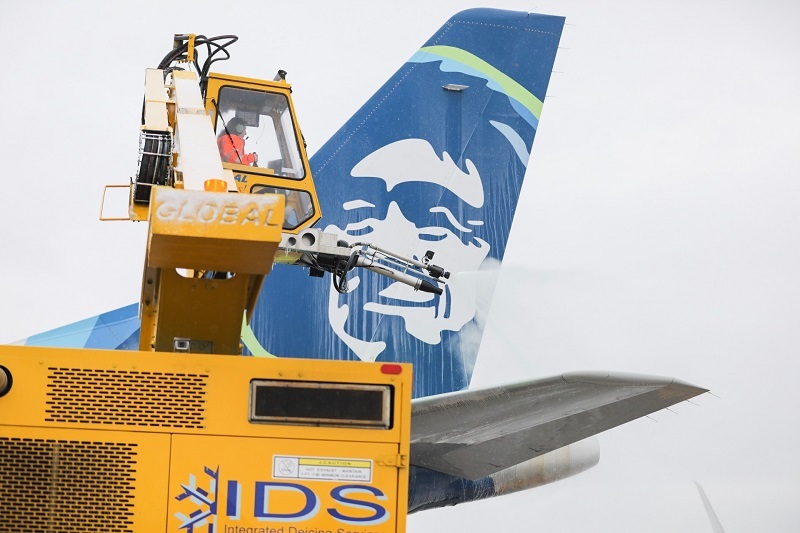 We are offering a flexible travel policy today for those wishing to change their flights in/out Seattle and Portland (where winter weather is expected later today). Guests can use our site to change flights on their own. Our Call Centers are reporting a very high volume of calls coming in from customers who need or want to make alternate arrangements. The self-service tool on alaskaair.com is also available to help make those changes. 6 comments on "Travel Alert: Flexible travel policy in place for Sea-Tac guests as snow storm wallops region"
Please post alerts more frequently. The ones on this page are from 2/2. More snow coming Sunday-Monday so we need to know what is happening with your flights out of Seattle. Any suggestions on navigating the next storms coming?! Due to fly into SeaTac on Saturday! Hi Jean. We’ll continue to post updates here on our blog, but feel free to reach out to our Reservations team at 1-800-252-7522. For quick answers, you can also text your questions to 82008. I fly exclusively on Alaska unless there simply is no other option. You can’t control the weather, but you can control how you treat your customers and even though my flight was 2 1/2 hours late taking off last Monday AM, your crew did an excellent job of keeping us informed, and comfortable. Having no information is always worse than bad news so at least providing us with updates allowed us mentally to deal with the delays. Thanks Alaska! This is why I am a million miler! I was stuck on a plan for 5.5 hours before we finally took off for JFK. I would just like to commend the fantastic crew we had that made the most of it. Thank you Alaska for being the best airline for my weekly business travel! I am one of the passengers affected, I had a tough time getting to the airport this morning at 5am, and I’m happy to say my flight has just departed at 3pm, about 7 hours late. I want to say thank you to all of the Alaska Air employees as well as the ground crew and SeaTac/Port of Seattle crews that showed up today, I know it was a tough day for everyone at the airport, but they made the best of the situation, and I’m extremely grateful to even be on my flight today!! !